Students work together to complete an assignment and practice their creative problem solving skills in the high school’s library. 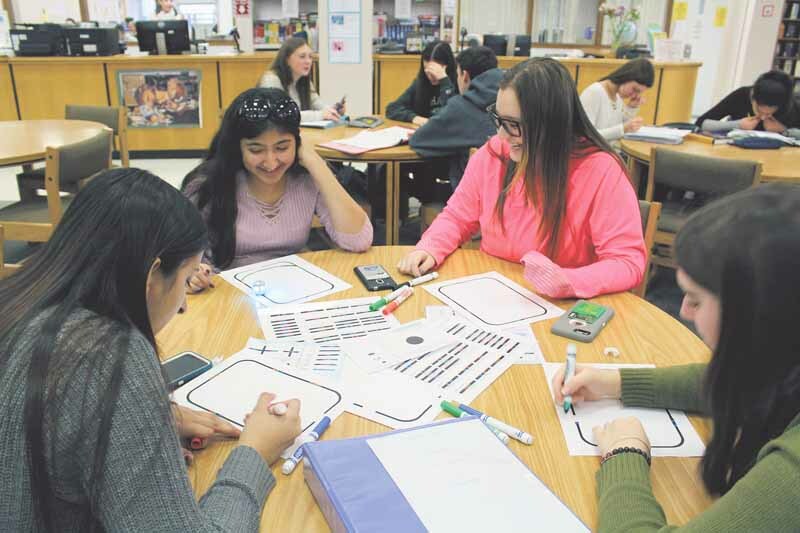 Plainview-Old Bethpage John F. Kennedy High School joined the upper echelon of schools recently when it was identified as one of 16 Reward Schools in Nassau County by the State Education Department. The honor, which recognizes schools with a high academic achievement or those with the most progress, was announced by state education commissioner MaryEllen Elia. Additionally, Reward Schools must maintain at least an 80 percent graduation rate—Plainview-Old Bethpage boasts a 98 percent graduation rate. Superintendent Dr. Lorna Lewis from the Plainview-Old Bethpage School District said that this honor was made possible by the hard work of students, teachers and the entire school at large. Besides Plainview-Old Bethpage, the Nassau schools honored include John F. Kennedy High School in Bellmore, Bethpage High School, W. Tresper Clarke High School in Westbury, Garden City High School, Great Neck South High School, Herricks High School in New Hyde Park, Jericho Senior High School, Locust Valley High School, Lynbrook High School, Manhasset High School, North Shore High School in Glen Head, South Side High School in Rockville Centre, Roslyn High School, Syosset High School and Wantagh High School.